During Gurdjieff's search for esoteric knowledge he unexpectedly came across a map of pre-sand Egypt, a pre-historic time when Egypt was green. This had to be about 7,500 B.C. or earlier. He immediately delayed his search for the Sarmoung monastery. 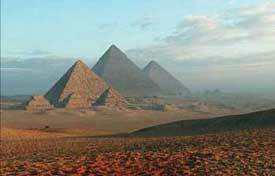 Whatever Gurdjieff saw on the map of pre-sand Egypt, it took him directly to the Giza Plateau. He said he came "to find an explanation for the Sphinx and certain other monuments." Now why an explanation? 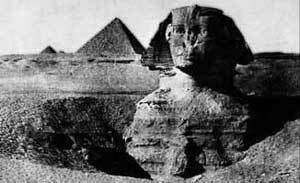 Even when Gurdjieff arrived, in 1895, the Sphinx was commonly thought to date from 2,500 B.C. If it was the Sphinx that Gurdjieff saw on the mapand what else could he have seen?then that would mean that the Sphinx was a monument of pre-sand Egypt, a monument carved about 7,500 B.C. or earlier. Even in 1895 when Gurdjieff visited, it was widely accepted that the Sphinx had been carved around 2,500 B.C., its erosion caused by wind and sand. Others, such as the noted hermeticist and Egyptologist René Schwaller de Lubicz, believed the erosion was caused by water. Now when was there enough water to cause such erosion? Only in pre-sand, or prehistoric Egypt. In 1990, John Anthony West, an authority on ancient Egypt, convinced Dr. Robert M. Schoch, an eminent paleontologist and a specialist in the weathering of soft rock, to validate or rebut the aquatic erosion theory. 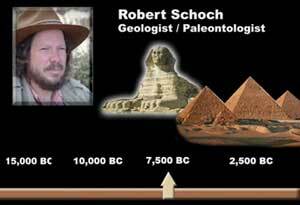 Schoch indeed found the Sphinx to be water-eroded, but he believes the cause was not flooding from the Nilebut rain, with a minimum date for its carving at 5,000 to 7,000 B.C.